A voter in Sandy Springs, Ga. on May 9, 2018. Georgia is one of 14 states that use electronic voting machines that don't produce a paper trail to verify results, which concerns many security experts. "The question remains whether the federal government will subvert the Constitution to achieve the goal of federalizing elections under the guise of security," Kemp told a technology website. Now, Kemp is the Republican nominee to be Georgia's next governor, and in another election season where cyber-attacks are in the air, his record securing the state's elections is becoming a campaign issue. This past week, the Georgia Democratic Party called for Kemp's resignation, citing in part his response to Russian-backed hacking attempts of state voting systems in 2016. Georgia is one of 14 states that uses electronic-only voting machines without a paper trail voters can verify for themselves. Cybersecurity experts agree this leaves elections more exposed to potential hacking and technical problems. Georgia is the most populous of five states using electronic voting machines statewide. Georgia Democrats say immediate changes are needed to secure this November's midterms. "Here we are. Three months before an important election. Living with the reality that once again Georgia voters might be going to the polls and not know if your vote actually counts," Democratic activist Caroline Stover told a crowd of 100 Democrats as they sipped beers and ate tater tots at an Atlanta bar last week. A handful of Georgia voters filed a pending federal lawsuit pushing the state to use paper ballots in this fall's midterms. But Democrats like Stover want Kemp to order a switch to paper ballots right away. Earlier this year, Kemp formed a commission to look at moving the state to new voting technology with a paper trail. But he says that switch shouldn't happen before this fall's election because it would cause chaos at the polls, and potentially suppress turn-out. "That would be an absolute disaster, changing from the current system we have now to paper ballots," Kemp said in an interview. Georgia was not on the list of 21 states that the Department of Homeland Security said had been targeted by Russian hackers in 2016. But a recent indictment by special counsel Robert Mueller of 12 Russian intelligence officers revealed that they had visited county election websites in Georgia and other states. Kemp's office later announced Cobb and Fulton counties in metro Atlanta were visited. It said, citing information from the federal government, that the specific web pages visited showed general, public information. 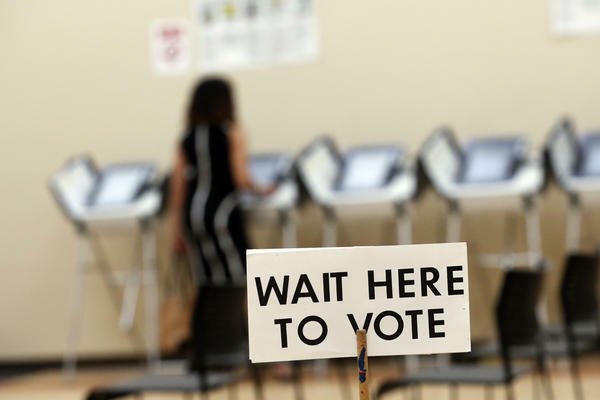 "There is no evidence that either of the county webpages were compromised as a result of this activity," read a letter sent by the state to local elections officials. The state said it assumes the Russian visitors were "conducting research to assist future potential operations." Kemp insists Georgia's voting system is secure. And Kemp said his management of technology issues as Secretary of State bolster his campaign's message, citing added firewalls to protect data, and regular work with vendors to to conduct cyber scans and security training for employees. Recently, the Secretary of State's office worked with the Department of Homeland Security to train local election officials. And the Secretary of State's office said DHS conducted physical security assessments in 17 Georgia counties. "If anything my record is a strength for me," Kemp said. "I'm glad to talk about that record all day long." But Kemp and DHS have had a rocky relationship in the past. Ahead of the 2016 election, Kemp criticized a proposal from then-DHS Secretary Jeh Johnson to designate voting systems "critical infrastructure" giving them enhanced protections similar to the electrical grid, for example. In December 2016, Kemp accused the department of hacking his office's network. The DHS inspector general later determined it was just normal computer activity related to a federal official checking Georgia's firearms license database. Before and after the election, Kemp's office declined assistance from the Homeland Security department to bolster the state's voting systems. "It's so frustrating that people keep bringing that up because DHS was offering to the states the same exact things that we had already been doing" with private contractors, Kemp said. Kemp said the relationship between DHS and his office has improved under the Trump administration. "We've been in constant contact with them," he said. "The communication level with the states is much better than it was when Obama and Jeh Johnson were there." President Trump's endorsement helped propel Kemp to a nearly 40 point, upset victory in Georgia's GOP primary for governor. Kemp is running against Democrat Stacey Abrams in a polarized race attracting national attention and money. In the first two weeks of the general election campaign Abrams has mostly shied away from attacking Kemp over how he's overseen elections. But other Democrats are fired up about Kemp's record on election security. For her, Kemp has no business overseeing any election when he's on the ballot himself. "I think he's not only failing in his duty, but he shouldn't have it," Starling said. "He should not have that responsibility anymore." Kemp is brushing off the Georgia Democratic Party's calls for him to resign even though some past Secretaries of State running for higher office here have stepped down. "The same people that are criticizing me on that," said Kemp "If I resigned...they'd be criticizing me saying 'you're scared, you're leaving your office, because you don't want to have to take responsibility for running the election because it's not secure or whatever.' So I mean I think that's just a political argument." Before Kemp won the GOP's gubernatorial nomination, some in his party questioned his performance on the job. Some Republican state legislators "just don't trust the current Secretary of State to run a competent election — and with good reason," said Scott Binkley, campaign manager for Kemp's GOP primary opponent, earlier this year. "We're looking to restore trust in our processes." Since Kemp won the primary, Georgia Republicans are quieter about Kemp's record on election security. Marian Schneider is president of Verified Voting, a non-profit that advocates for paper ballots. She said election administration in the U.S. has always brought partisanship. Today, she worries it will hurt the country. "This issue of election administration and election security is not a political issue," she said. "It's a national security issue. These are national security concerns." As candidates in Georgia fight to win over voters, they'll also be arguing about whether the technology used to cast and count their votes can be trusted. And now onto election security, which is a huge campaign issue ahead of this year's midterms. In Georgia, the Republican candidate for governor is also secretary of state. The top election official, Brian Kemp, insists Georgia's elections are secure. But as Johnny Kauffman of member station WABE reports, Democrats want immediate changes. CAROLINE STOVER: Thank you. And again, we're here at Manuel's Tavern in Atlanta. And we do have people from all over Georgia tuning in. So welcome, everyone. JOHNNY KAUFFMAN, BYLINE: Caroline Stover, a Democratic activist, speaks to about 100 people in the back room of a wood-paneled bar as they sip beers and eat tater tots. They came to learn about Georgia's election system. And what they hear from Stover and others is that the system is not secure. STOVER: Here we are three months before an important election, living with the reality that, once again, Georgia voters might be going to the polls and not know if your vote actually counts. KAUFFMAN: One big topic at Manuel's Tavern is paper ballots. A handful of voters filed an ongoing federal lawsuit pushing the state to use them in the midterms. Democrats like Stover want Republican secretary of state and candidate for governor Brian Kemp to order a switch to paper ballots himself. STOVER: Enough is enough. And we simply can't wait any longer for, for example, our secretary of state. KAUFFMAN: Georgia is one of 14 states that uses electronic voting machines without a paper trail or paper ballots. Cybersecurity experts agree this leaves elections more vulnerable. Worst-case scenario - hackers manipulate Georgia's vote totals. And there's no paper backup to do a manual recount. That could mean chaos. Kemp isn't opposed to paper ballots. But he says a switch to them shouldn't happen before the 2018 election. BRIAN KEMP: And that would be an absolute disaster - changing from the current system that we have now to paper ballots. KAUFFMAN: Kemp has faced questions about the security of Georgia's elections. Ahead of the 2016 contest, an outside researcher found voter information and passwords unsecured on a state contractor's website. After Russian hacking attempts were revealed, Kemp turned down assistance from the Department of Homeland Security. A few months later, he accused DHS itself of hacking the state's network. That proved to be false. Kemp insists Georgia's elections are secure. KEMP: I think, if anything, my record is a strength for me. I mean, I'm glad to talk about that record all day long. KAUFFMAN: Kemp notes added firewalls and regular work with cybersecurity vendors. Before he won the Republican nomination, some in Kemp's party questioned his record. They're more quiet now. Kemp's opponent, Democrat Stacey Abrams, hasn't criticized him much. But other Democrats have. ELIZABETH STARLING: I think he's not only failing in his duty, but he shouldn't have it. He should not have that responsibility anymore. KAUFFMAN: Back at the bar, Democrat Elizabeth Starling says Kemp has no business overseeing any election as secretary of state when he's on the ballot himself. KAUFFMAN: The Georgia Democratic Party this week called for Kemp to resign. While some previous secretaries of state running for higher office here have stepped down, Kemp says he has no plans to. Marian Schneider says election administration in the U.S. is often run by partisans. But today, she worries it will hurt the country. Schneider is president of Verified Voting, a nonprofit that advocates for paper ballots. MARIAN SCHNEIDER: This issue of election administration and election security is not a political issue. It's a national security issue. These are national security concerns. KAUFFMAN: Schneider says everyone should still vote. As candidates in Georgia fight to win those votes, they'll also be arguing about whether the technology used to cast and count them can be trusted. For NPR News, I'm Johnny Kauffman in Atlanta. Transcript provided by NPR, Copyright NPR.